This year’s season is coming to an end and I couldn’t be happier with the way Marron and I finished it off, with two big wins in the CDS and USDF Regional Championships in Grand Prix! Every year, so many of our great California riders, qualifies to ride in the Championships. For many, it’s the real highlight of the year. This time, the finals were held here in Los Angeles, at the Los Angeles Equestrian Center in Burbank. Region 7, which is our region, includes California, Nevada and Hawaii. Over 350 horses participated in all the different levels, the classes where not only huge but also very competitive since we are fortunate to have so many good horses and riders in this region. I was amazed by how well the show was organized, thanks to the California Dressage Society and the Cornerstone Dressage Events who worked really hard to make this a fantastic weekend. For me it was extra fun to be able to show how great Marron still is and even though he is now 18, he still has it! I was qualified to ride in the Championships with all three of my horses but chose to only bring Marron and keep the other two at home to work towards the next, higher levels. They are both doing really well and I’m looking forward to bring them both out soon. As our next show we are heading down to San Diego for the Spooktacular Halloween Dressage Show in the end of the month where Ramour will be doing his first Prix St. George. So once again, I think this was the 7th time I had a horse in the Finals. It’s always exciting to try out, and then just hope that you will make it. This year, just like in 2017 I did qualify with my Grand prix horse Marron. For the past couple of years the Finals has been in Gladstone, NJ, but this year we were at Lamplight outside Chicago. The venue is beautiful and this year there were so many different categories of dressage. Everything from the young horses, juniors, young riders, developing horses - just name it, and it was there. Because off that, there were a lot of great horses, riders, trainers, and spectators. It’s always inspiring to meet them all. It makes you work harder, always try to train, teach, and ride better! I like that!! I flew with my horse and we arrived a couple of days before the show. It’s the best way to travel, but it is expensive. There were 14 horses on the flight, so we were a big group of riders that arrived early. What’s fun about that is that you finally have a chance to see your friends, more then just to say hi! At a normal show there is no time to talk, we all ride, teach and very seldom have time to catch up! Californian riders, trainers, and grooms are so much fun that I enjoyed spending some extra time with them. Marron was great at the show! The scores were very close and I had really good rides! I We ended up in 4th place over all this time. I know at heart that we could have been better…But it’s a new day, every day! The respect and comments from my pals are sometimes more valuable to me then a comment from a judge. It was so much fun to meet so many riders, trainers, and friends from all over the US and it’s just sad that the country is so big, that it’s hard to stay in touch. Anna Blomdahl came along, once again, to help me out as a groom, and I’m very thankful for all her help!!! Anna is also the best photographer and is the one that always takes all the great pictures! She has the best eye!!!! As well as Cory Walkey who is a great eye on the ground and a fun supporter!!! The next show coming up for me and Marron is the Regional Finals in the end of September. This year it will be at LAEC in Burbank. I will show GP on Friday and Sunday! Both Ram and Fuego has also qualified for the Regionals but I have decided to have them stay home and we will continue to work towards the next, higher level. The fall is filled with training, clinics, and much more. My friend and international judge, Birgitta Bergsten, will come next month to help me from the judges point of view. She has an eagle eye and always knows how to ride every movement correct. I will also attend the “Queen of dressage”, Isabell Werth’s clinic in San Diego, but only as a spectator. This will be very inspiring! I’m very much looking forward to an interesting fall! I will keep you posted on what’s going on! National Finals, Lamplight, Chicago. August 21st-26th. Once again Marron and I are riding in the Finals! Last year we were at Gladstone, NJ, in the Grand Prix, my favorite place, but this year the show will be in Chicago. It’s always fun and very exiting! This year the show will be huge, with great riders and horses in so many divisions. Everything from the young horses, developing horses, young riders, ponies, all the way to Grand Prix. Marron and I will fly out early Friday morning. The jog for us will be on Tuesday, and my first go is on Thursday. I will first ride GP, then Grand Prix Special, and on Sunday the Freestyle. The rider/horse combo with the highest % from all 3 classes will be the National winner. GP counts the most. Marron feels great and I have prepared him as good as I can! Now I just hope the trip and the weather will be ok! It’s harder on a horse to travel that far if you are a touch older, even if his brain and attitude never will show so.. Cross your fingers and I will ride my best! Thank’s to Anna Blomdahl and Cory Walkey for your help and support, as well as Gina that will come by and lend a helping hand! With Anna's help I will keep you all posted how the show goes! Fuego is looking stunning from ears to tail in his new PS of Sweden outfit! Bridle, wraps, bell-boots and sadlepad, all from the new summer collection. The saddle is of course, as always, from Custom Saddlery. It is still the saddle that fits the best on all my horses, plus it goes perfect with the new line from PS! Another nice clinic with fun riders and horses in beautiful Salt Lake City, Utah on May 11-12th. Here a picture of one of the riders with a backdrop of snow kept mountains due to the cold weather. 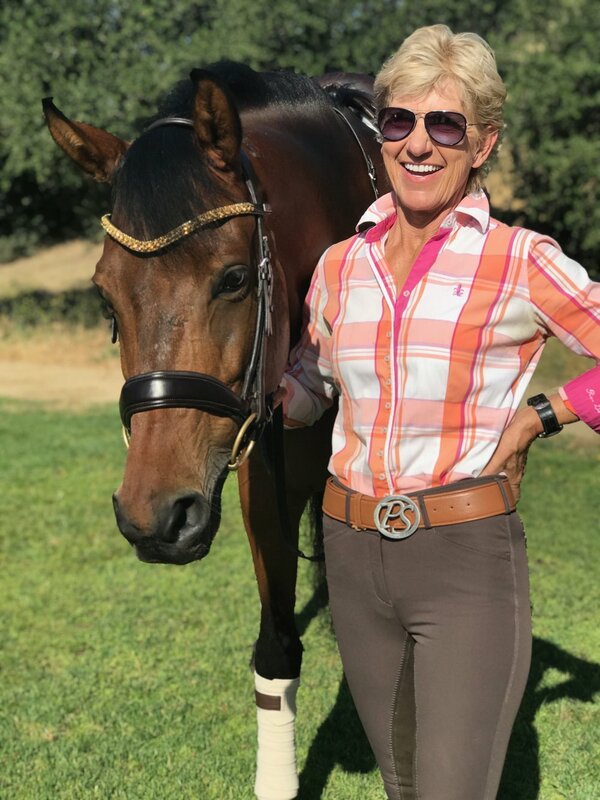 As an owner and rider for the Nations Cup 2017, Mette received a beautiful trophy with her and Marron's name engraved on it together with the dates of the two Nations Cups in Europe which the pair participated in, as part of the US Dressage Team. It was a wonderful ending of a great week at the CDI3* in Rancho Murieta, CA. Despite the weather, that once again was horrible, with covered arenas and a well organized show it all worked out. Marron won the CDI GP Freestyle with a high score of almost 74% and he would have also won the Grand Prix if I would have walked to the correct letter. I picked S instead of H and that was a 2% deduction from each judge for that mistake. We still ended up second but the win was mine. My other two horses, Fuego (3rd level) and Chrevi's Ramour (4th level) won their classes and both of them are stepping up to the plate. Not sure right now, when the next show will be for me, but this was a really good one! I will keep you all posted! Even if I thought I would never be able to compete, when the worst rain storm was hitting LA, I did manage to pull it off and it turned out to be a very successful weekend. I showed my three horses in the national show; Marron - GP, Ram - 4th level and Fuego 2nd level. They were all super! It's hard though to write about that you win your class, when there is barely anyone in it, but it is the scores and the judges comments that counts and whats really making me happy. The highlight of the weekend was that Anna and her horse Lourdes won both the CDI Prix St. George and the Int.1! So between the two of us, we once again did really good. The next show for me will be the CDI 3* in Rancho Murieta. This time Marron will do the Grand Prix and the Musical Freestyle. Ram and Fuego will compete in the national show, Ram is still doing 4th level and Fuego is going to try out in 3rd level. I'm very much looking forward to this show and I will keep you all posted! 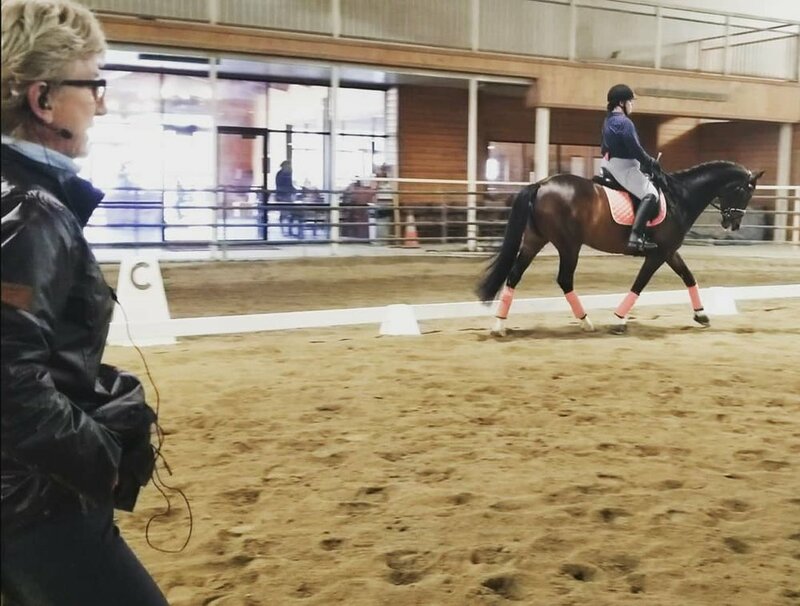 I had the pleasure to be teaching a wonderful group of up and coming young riders as well as some adults in Minneapolis this past weekend at the beautiful farm owned by the Schmidt Family. Here is Bianca Schmidt on her lovely horse Cenna.